SPEEDY prospect Gods Spirit should have little trouble continuing his rise to the top when he heads to Tabcorp Park Menangle tomorrow. Kept fresh since his victory at the same venue three weeks ago, Gods Spirit has drawn to lead throughout from the pole for co-trainers Lauren and Shane Tritton. Pleased with the four-year-old’s progress, Shane expects Gods Spirit to prove too slick for his more experienced rivals. Gods Spirit has only had three starts – including a debut win last December – and is unbeaten from two outings for the Trittons. “He has come along really well,” Shane said. “I freshened him up a bit after his last run and he feels terrific. “I’ve made no secret of the high opinion I have of him and that hasn’t changed. “He’s got so much raw ability and speed to burn that if he can bring it all to the track as he also learns what racing is all about, he can be anything. With no specific short term plans in mind for the son of Tintin In America, Shane has set the Chariots Of Fire as God Spirit’s main priority for the season. 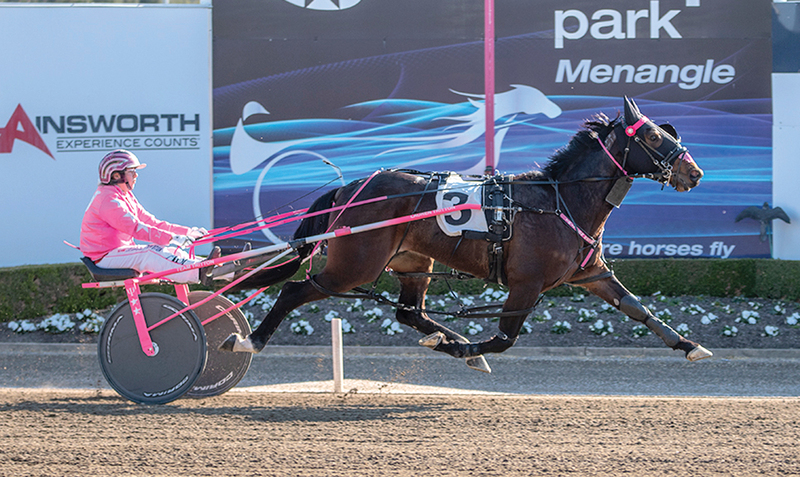 Australia’s premier four-year-old event, the Chariots Of Fire is scheduled to be run at Menangle on February 16.